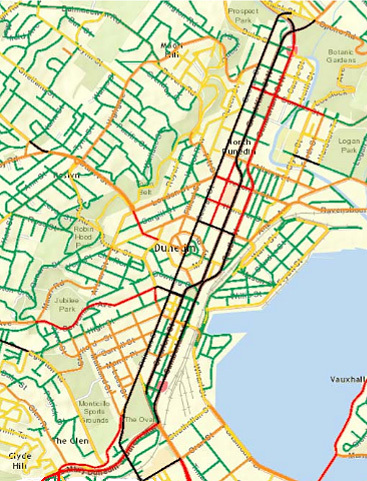 █ UNDEMOCRATIC—Council staff agendas are directing major changes to Dunedin’s road networks. Continued use of exclusive ‘workshops’ lacks transparency and accountability. The first step towards securing funding for major changes to Dunedin’s road networks has been taken by the Dunedin City Council, even though exactly what those changes will be is yet to be decided. Councillors yesterday noted council staff had taken the first of six steps in a new process for applying for funding from the New Zealand Transport Agency (NZTA). Council staff have recently submitted two Strategic Case applications to the NZ Transport Agency; one for investment to improve the access, mobility and safety of the Central City; and the other to enhance Dunedin’s Freight Network. Pending approval from the NZTA, Council staff will begin the Programme Business Case stage, where investment options and alternatives will begin to be developed and defined. Staff will seek Councillor support and input prior to the submission of the Programme Business Case to the NZ Transport Agency, anticipated to be later this year. ● that the best value option is affordable and deliverable and that the risks are acceptable. To execute many of the projects outlined in Dunedin’s Integrated Transport Strategy requires funding from external sources. A significant source of transportation funding is potentially available from the NZ Transport Agency. As detailed above, Council must now apply for funding from the NZ Transport Agency through their Better Business Case approach. This stepped approach ensures that any solutions are in response to clearly defined problems, and are aligned to the NZ Transport Agency’s investment goals. Council staff held initial discussions with key stakeholders, the NZ Transport Agency and the Otago Regional Council to define the areas of focus for investment. The group agreed that the Council should focus on establishing two Strategic Cases: 1. Dunedin Central City: Access, Mobility and Safety; 2. Dunedin Freight Network. These areas strongly align with those set out in our Integrated Transport Strategy. The first step of establishing the Strategic Case is to develop an Investment Logic Map (ILM). The ILMs set out the key problems and the benefits of solving the problems. Two ILM workshops were hosted for each of the areas of focus. Participants included the key stakeholders (DCC staff, Council Committee Chairs – Cr Wilson, Cr Benson-Pope, Cr McTavish; NZ Transport Agency and the ORC) and relevant partner organisations (including Otago Chamber of Commerce, Public Health South, Port Otago Ltd, Kiwirail, and Heavy Haulage Association). Staff from the Dunedin City Council (DCC), the NZ Transport Agency and Otago Regional Council (ORC), as well as the Public Health Service and the Otago Chamber of Commerce participated in two Investment Logic Mapping (ILM) workshops to identify the key access, mobility and safety problems in central Dunedin, and determine the benefits of investing in solutions that address these problems. This report sets out the strategic case for improving access, mobility and safety in central Dunedin. Part A provides the strategic context and fit of the proposed investment and the evidence to support the justification for investment. Part B describes how the three contributing organisations intend to develop the next stage of business planning – the programme business case. This section outlines the further planning needed to achieve the identified benefits. This application shows that that there are some key synergies between the strategies and objectives of the three key stakeholder organisations, where priorities for future investment align. Evidence supporting each of the key problems identified in the ILM workshops is outlined section 3.4, and reveals a strong case for change and need for investment. A risk assessment process known as KiwiRAP maps the collective crash risk of roads based on the physical and operating characteristics of intersections and corridors, as well as crash history. The map shows that Dunedin’s high risk areas (shown in black and red) are predominantly located within the central city, as demonstrated in Figure 1. This section demonstrates how the investment proposal has clear linkages to existing strategies of each of the stakeholders. There are some key synergies between the three organisations, where priorities for future investment align. A summary of the strategies that support this investment proposal from each of the stakeholders is detailed below. The goals and/or objectives selected are those with direct relevance to this investment proposal. The evidence to support the three problem statements developed during the Investment Logic Mapping workshops generally provides a strong case for change. It is also evident that many of the problems have existed for some time as many of the issues raised were recognised in the MWH 2003 Strategic Corridor Study and the 2006 Transport Strategy. Appropriate risk management strategies for these key risks will be identified at the Programme Business Case stage. As the busine ss case evolves and projects are defined it is likely that other risks are likely to be identified and these will be added to the risk register. Developing, maintaining and operating any transport system requires investment, and investment requires decision-making about what to invest in, how much to invest and when that investment should be made. Such decisions need to be informed by an understanding of the key issues and opportunities to be addressed, a clear vision of what is to be achieved, and a clear set of priorities that will move toward that vision. In times of financial constraint when funding is tight the need to clearly identify the right priorities becomes even more important. The DCC have adopted a Financial Strategy which aims to help steer a course between the competing tensions of affordability, keeping up and investing for the future. This Financial Strategy states the limits to rates and borrowing that the Council has set, and any investment in transportation infrastructure must be managed with regard to the Financial Strategy.